Menacing motorists, who speed, run red lights or drive while using their mobile phones, will face a range of consequences including penalty points notched on their record, hefty fines and, in extreme cases, jail sentences. The authorities are determined to put an end to the carnage and chaos that has been witnessed on the kingdom’s roads in recent years. 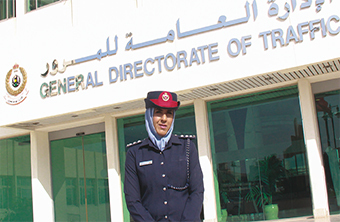 Captain Hind Ahmed Al-Thawadi, the head of the Traffic Awareness Unit in the General Directorate of Traffic, believes that its current ‘RE-THINK’ campaign sends a powerful message to all drivers in Bahrain. She said: “We have been promoting this campaign for the past two to three months, spreading awareness about the new traffic laws which will take effect on Saturday. “We have reached out to people through signs, online social media sites, in newspapers, on radio and television to educate drivers about the new laws. We have even discussed the campaign at different events on the island, at institutions, corporations and other venues. Captain Hind says although existing traffic regulations have been in place since 1979 they have had to be adjusted to meet the demands of modern times to take into account, for example, the use of mobile phones during driving and the increase in the number of vehicles on the roads. From Saturday lawbreakers will receive penalty points which could lead to them having their driving licences revoked, in a system similar to the one adopted in the UK and elsewhere. Depending on the severity of an incident, she explained, a specific number of points would be placed on a driver’s record. If that individual collects 20 points over the course of a year from the time the first violation is recorded, then the driver’s licence will be revoked for three months. And then it’s a case of ‘double dare’. Should the driver get caught re-offending once they get the licence back they will lose it for six months should they pick up another 20 points in that year. Do it again and it will be revoked for a year and subsequently for good. The only way to get back on the road would be to attend a traffic school and repeat the procedure of getting a driver’s licence all over again. However, those who learn their lesson and pick up less than 20 points over a 12-month period will get a clean slate at the end of it. “The new laws include strict penalties but these penalties will be imposed gradually with the new points system,” said the police chief. It’s not only the accumulation of points that bad drivers face, they will also be hit in the pocket too with hefty fines being introduced as a deterrent. According to Mooza Alzayed, one of the main legal researchers in the General Directorate of Traffic, the tough new monetary penalties will help impress on the public the importance of driving with care and consideration. She said: “Earlier, lawbreakers would say ‘oh, that’s a simple fine, I will just pay it’. They wouldn’t have felt what they did was wrong or learned anything from it. To ensure offenders pay up promptly, they can have their fine reduced by half if they settle it within seven days. Otherwise they will have to pay the full amount. “It will motivate people to pay straight away and hopefully act as a reminder of what they have done and ensure they take responsibility for their actions,” she added. “The new laws attempt to rid bad behaviour on the road. These rules are made to stop people from speeding, overtaking, jumping a red light and using their phones while driving. Drivers will still be able to legally use hands-free phones, but if caught using hand-held mobiles they face up to six months in jail and/or a fine of BD50 to BD500. Motorists running a red light could face up to six months in jail and/or BD100 to BD500 in fines. Racing along could also result in a jail sentence along with various fines depending on the speed recorded. Those driving above 30 per cent of the speed limit could face up to six months behind bars and a fine up to BD500. If a driver causes an accident whilst speeding and injures someone or damages property they could face a three-year jail sentence and/or fine of BD1,000. Driving under the influence of alcohol could lead to a one-year jail sentence and a similarly steep fine. Those who repeat any offence within a year will find the penalty doubled. There will also be fines from BD20 to BD100 for parents caught allowing children under the age of 10 to sit in the front seat or without a child’s seat, occupying a parking space allocated for those with special needs, not giving way to ambulances and not wearing a seat belt. In the past year there have been 77 serious injuries, investigators say were due to swerving or overtaking and 331 severe injuries as a result of drivers being distracted by talking on their mobile phones. In total 61 people were killed in road accidents and 544 drivers and passengers suffered serious injuries in Bahrain. In the kingdom’s southern area there were 433 accidents and in the northern part, 424. The most accidents occurred in the capital area with a tally of 697 and in Muharraq there were 197 recorded. According to analysts many of the drivers involved in the most serious accidents are aged 18 to 28. She explained: “This is why we have been staging educational lectures on driving and road safety at schools. We are targeting kids from kindergarten to graduates, taking them on field trips and teaching them proper road etiquette in a concerted attempt to get the message across to future generations. “Aside from targeting youngsters, we also stage a different campaign every three months in accordance with the Gulf Co-operation Council. We research the statistics and archives to see where the increase in casualties comes from and then target that area. “Bottom line, drivers need to take into consideration the people around them and think about their families. They need to think how an accident could affect their mother, father, wife, husband, children or friends that are waiting for them at their destination. The Director-General of Traffic Colonel Shaikh Khalifa bin Hassan Al Khalifa recently announced in a press conference that spy-in-the-sky helicopters will also be brought in to help enforce traffic laws and traffic control rooms now contain sophisticated equipment to help ensure the crackdown is enforced.